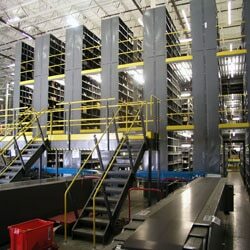 Do You Need A Mezzanine Storage System? Take advantage of unused overhead space to double or even triple the existing space in your facility. Mezzanines are a cost effective and time efficient alternative to new building construction and provide added space that can be used for any number of applications including storage, offices, or staging areas. Also known as a structural mezzanine, free standing mezzanine allows for maximum use of floor and mezzanine level space. It provides easy assembly and disassembly and the wide-span design allows traffic flow under platform. This style provides additional storage areas above or between pallet racks. Also known as catwalks. 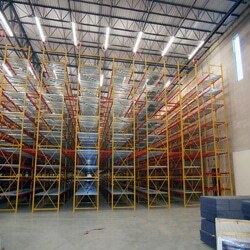 Allows for multiple loading and unloading locations of pallets simultaneously within racking systems. This is an ideal option for expanding storage of smaller items above shelving. The shelving serves as a base for the mezzanine. It is an economical way to expand existing space, but least flexible for reconfiguration. REB offers both pre-engineered and custom-engineered mezzanines to meet your design and load specifications. 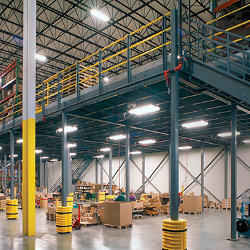 We incorporate features into your mezzanine to facilitate safety and efficiency. Flooring: We offer a durable flooring solution for every mezzanine application. Choose from resin board, corrugated decking, open bar grating, open steel planking, and concrete. 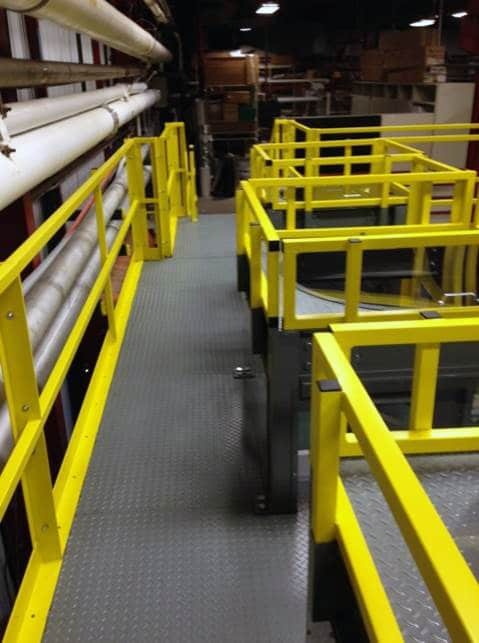 Handrails: Our handrails are designed to keep employees traveling on the mezzanine safe. Three options: Two rail gate, three rail gate, or wire mesh gate. Gates: We can incorporate a gate into your mezzanine to expedite proper material handling. Mezzanine gate options include single swing gate, double swing gate, sliding gate, lift-out safety gate, and safety pivot gate. Bracing: The type of bracing for your mezzanine depends on the vertical and horizontal forces created by your load requirements. We supply and install bracing necessary to ensure the structural integrity of your mezzanine. 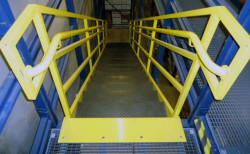 Staircases: All staircases meet IBC safety standards. With numerous models and options available including number of rails, angles, risers, tread, and step width, we can install a staircase that meets your requirements. Ladders: Ladders are designed to meet IBC safety standards, ensuring safe travel throughout the mezzanine. Fill in the form or call us today at 1-800--252-5955!